EGYPTAIR in the first half of 2018 plans to expand capacity on Cairo – Mumbai route, currently operated by Boeing 737-800 aircraft. From 16JAN18 to 31MAY18, this route will be operated by Airbus A330-200 aircraft, 4 times a week. 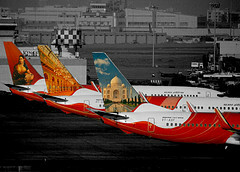 The airline’s Mumbai service in October 2018 is also scheduled with A330-200 aircraft.